China and India’s contemporary rise to prominence will significantly impact upon geopolitics over the coming decades. Based upon the presenter’s recent book – China and India: Asia’s Emergent Great Powers (Polity, 2017) – this talk will provide a comparative analysis of their shared emergence as great powers within the international system, and evaluate the impact of Asia’s two largest powers upon the definition and nature of power politics in the 21st century. Focusing upon the factors integral to such a phenomenon (from both historical and theoretical perspectives), it will highlight these two countries’ past, contemporary and future global significance. India and China are often expected to rise in much the same way as the current and previous great powers, primarily via traditional material and military measures. Dr Ogden vitally contends however that domestic political / cultural values and historical identities are also central driving forces behind their mutual status ambitions and world views. 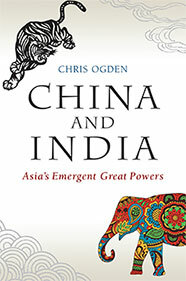 Dr Chris Ogden is Senior Lecturer in Asian Security at the University of St Andrews, where he teaches on the international relations of China and India, and emergent great powers in Asia. His research interests concern the interplay between foreign and domestic policy influences in East Asia (primarily China) and South Asia (primarily India).